I must admit this. I am a birder embarrassment. Some of you were born into birding and have done it since you were in diapers. For me, I had only just begun discovering birds while on my trip to Panama. And the pictures will reflect this as I was a developing birder and photographer. The Bocas Del Toro region is rich in wildlife and habitat. It's a chain of islands that all have different "feels" to them. We spent most of our time on Bastimentos Island (or Isla Bastimentos) at Bastimentos National Park, but we also explored other areas like the Soropta Canal. I'll cover these very different areas in this post from the Bocas Del Toro region. For me, at the time, I was just learning how to use what I would now call a "primitive camera". It became clear to me that I needed a stronger zoom lens that I could control. I also knew that I would look back on this trip as a trek with birder regrets. Before meeting other birders, I was learning everything on my own and didn't have someone there to clue me in on how to organize my time. But I am a quick study and within these past two years, I've learned so much. However, as we all know with birding, there is always so much more to understand. There were a lot of birds in this region. I saw my first Northern Jacana here. There was a bird that looked like a Kiskadee but had a decurved bill "licking" bananas. 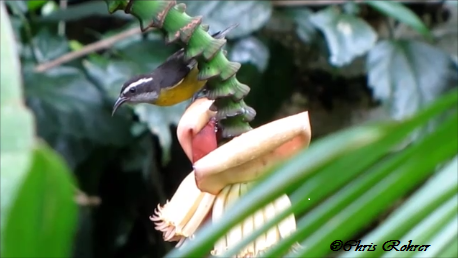 Turns out I discovered my first Bananaquit. So after this trip I had regrets about my treks around the world. How many places had I been? And how many times had I not paid attention to the birds around me? I also learned about strategy here. A birder brought his family to a local Bed and Breakfast on Isla Bastimentos. He secretly admitted to me that while they were occupied by chocolate and frogs, he was finding life birds. The kids would go swimming. Mom would hang out on the beach. And Dad? He searched for shorebirds. Smart planning. Me? Well I was chasing the red frogs famous on this island, studying the plants(I'm a huge plant geek), eating the chocolate grown on the island and observing the local Ngöbe-Buglé tribe. Now, moving on around this interesting and very birdy archipelago, we head to the Soropta Canal. Pelicans, Terns, and Gulls later, we arrive to this overgrown and forgotten canal. There were times I thought we would never get out of this overgrown mess. It was a rare and often missed opportunity to bird. You see, we were there to save turtles. But we spent much of our time on this canal! It was hard to navigate and many times we would get stuck in the water hyacinths. At the time, I thought it was a frustration. Now I see it as a missed opportunity to view all of the incredible birds hanging out in the Canal. I began to learn that birding was pretty awesome because the locales alone were stunning. This is the Soropta Canal at its best. As we went further into the canal, the open water disappeared. The islands in the humid and tropical Bocas Del Toro are home to birds found around rivers, oceans, mangrove swamps, and forest. It's quite the diverse habitat and a must see for a person visiting Panama. For the family, there is much to do. For the birder, it's a true vacation. If you're thinking about birding in Panama, check out these other posts from my Panama trek on Panama City, Gamboa and the Pipeline Road, and Coiba Island. It truly is a birder paradise. There are too many areas to explore, but when I go back again, I'll be stopping at the places I missed on my first trip. I must find that Harpy Eagle! Boquete will be our next stop. Until next time, happy birding! Great post, Chris! Birding Panama sounds like an awesome time! The scenery, people and the critters are all part of the fun! Wonderful photos. Happy Birding! Thanks Eileen!! Birding in Panama is wonderful. The humidity not so much:) Guatemala and Costa Rica are much nicer:) BUT Panama has a lot to offer. Sounds like a great place to learn lots. Just what are chiggers though? Chiggers are nasty little tiny bugs that crawl up into your pants, along the waistline of your pants, up your sleeves and bury into you skin. They itch. And if you itch the area, it becomes worse. Nasty little critters. Not birding the first visit certainly gives you an excuse to return plus the opportunity to learn about the environment, including the chiggers. What do the locals do? Except for the chiggers - it sounds like a great place to visit. I guess I am not a true birder because I think that if you enjoy the whole thing that's the important bit! Nie wiem czy bym się nie bała gadów w wodzie, pewno tak :(.Może by to trochę mnie przestraszyło, aby iść i oglądać ptaki. Podziwiam Twoją chęć zobaczenia ich za wszelką cenę.Zdjęcia z tej części świata oczywiście wspaniałe. Pozdrawiam. I do not know if I was not afraid of reptiles in the water, surely this: (. Might be a little frightened me to go and watch the birds. Admire your desire to see them at all costs. Photos from this part of the world, of course, great. Yours. There are definitely challenges but it is so worth it Giga:) Nothing beats that feeling of finding a lifebird. Truly exciting! I really enjoyed your post, Chris. Reckon I still call myself a "bird watcher" instead of "birder" because I love all aspects of a trip outdoors. Yes, I emphasize birds, but I sure enjoy all that other stuff out there! I love it as well, and I need to keep my eyes open to more than just the birds. They are on my mind all the time. I can't shut it off:) As for the bugs, I am laughing at your comment. It sure helps having a decoy:) I felt terrible. My friend Jen took most of the bites on our trip. Looks like quite an adventure! The sloth is awesome! That was taken from our boat in the mangrove swamp. Very fun find! Thanks for stopping by! I need to put this place on my list. Looks really great. I love that sloth shot! A superb post Chris and a very worthwhile diversion from visiting your own blog. I'm not sure that, at my age, I'd be able to put up with the discomforts in order to experience these fabulous sights and creatures. With regard to what constitutes a 'birder', I sense that you and I are very similar in our diverse interests. However, I don't manage to have the depth and passion that you exhibit - I'm too lazy!! I guess I'm more of a 'part-time birder'!! Hi Richard:) I think I may be an addict. But if there was one to addiction to have, this is probably a good one. I wish I could shut it off sometimes. Thanks for stopping by.....my greatest concern on these trips is finding owls!!! They are elusive! We both live in our areas and know the hotspots where they all hang out. When I travel, I hold hope that I may stumble on one of those beauties in the trees. What a wonderful post! I don't consider myself a birder. I just take photos of everything I see on my walks weather it's scenery, birds, flowers, animals or something else. Chris, gorgeous scenery and a fun story-minus the chiggers of course! You are braver than I am and will see many more birds in your life time than I ever will! The short video at the end is hilarious. How did you find that song? LOL! Terrific post, Chris! I can relate to your words. Before I became a "birder" and photographer, I was fortunate to visit Africa (on safari) a few times and also travel to Antarctica. I sometimes look back and wish I would have paid more attention to all the glorious birds I observed and been able to photograph them all. That said, I had truly spectacular experiences that I will never forget. Traveling to those otherworldly destinations certainly changed my life for the better. The Bocas Del Toro region looks like a marvelous place to visit ... except for those pesky chiggers. I think I will have to add this to my travel wish list.